Nexus Gold Corp. ("Nexus" or the "Company") (TSX-V: NXS, OTCQB: NXXGF, FSE: N6E) is pleased to announce that it has entered into a letter of intent with 1082545 B.C. 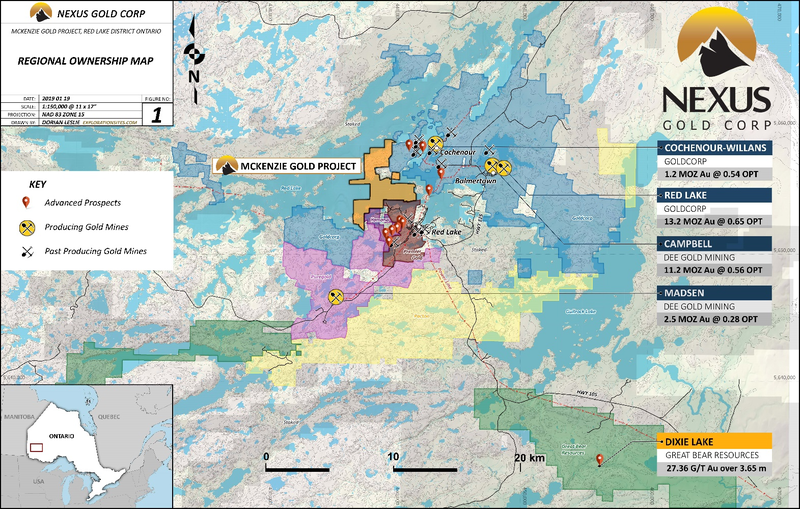 Ltd. (the "Vendor"), an arms'-length party, to acquire the McKenzie Gold Project (the "Project"). The Project consists of a series of mineral claims located in the Red Lake region of Northwestern Ontario. In consideration for the Project, the Company is required to issue 6,000,000 common shares and complete a one-time cash payment of $150,000. In 2017 a ground reconnaissance program resulted in a prospecting discovery, with high-grade samples returning up to 313 grams-per-tonne ("g/t") gold ("Au"). 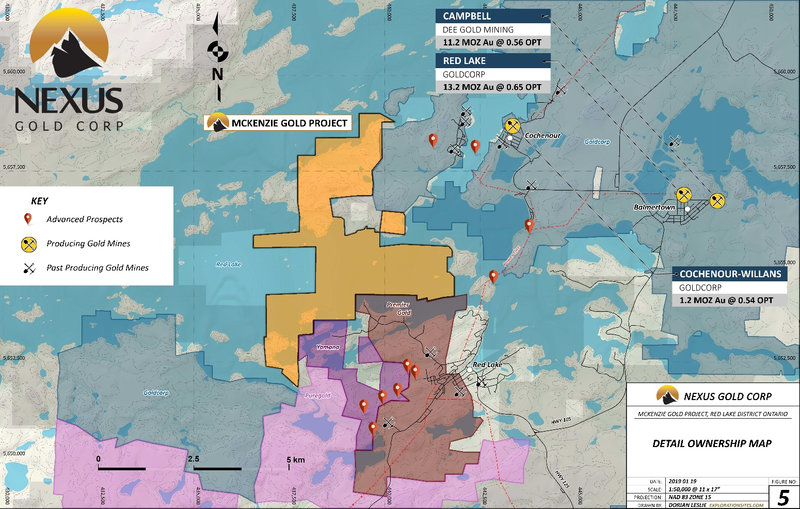 A new showing on the southwest corner of McKenzie Island, located in the northern portion of the project area, was also discovered during this program and returned multiple high-grade samples ranging from 9.37 g/t Au to 331 g/t Au. This new discovery lies approximately 100 meters west of a historical showing where gold values of up to 212.8 g/t Au have been reported in provincial government files. "The McKenzie Gold Project, with numerous high-grade showings, presents a compelling exploration opportunity for Nexus. This acquisition will give us two highly prospective Canadian-based projects with potential high-grade upside, that provides an excellent compliment to our active West African portfolio," said president & CEO, Alex Klenman. "Red Lake is a high-profile, well-established gold producing region that garners much market interest. By expanding our jurisdictional scope here, and elsewhere, Nexus can reach a much wider audience. Once this acquisition is completed, Nexus will have six projects on two continents, in some of the most prolific gold producing regions on the planet. We feel this puts the Company in an excellent position for growth, particularly in a stronger gold market," continued Mr. Klenman.